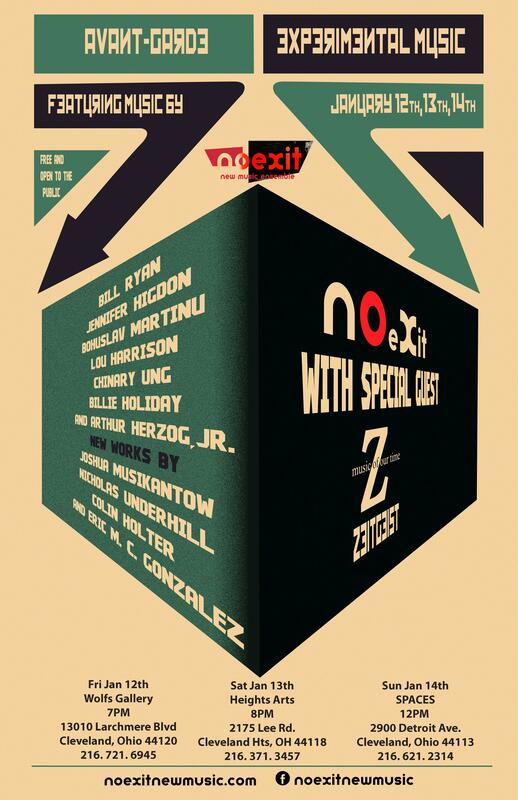 Please join No Exit and their special guests, the always astounding Zeitgeist (from St. Paul, MN. ), as they ring in the new year at SPACES. Last year’s No Exit/Zeitgeist collaboration at SPACES was amazing and this time around will be no different! The two ensembles will share a stage to present an extraordinary concert of immersive sonic landscapes which will feature “Spiral XIV” by Chinary Ung, Bill Ryan’s structured improvisation “Blurred” and new works by Joshua Musikantow and No Exit’s own Nicholas Underhill and Eric M. C. Gonzalez. Free and open to the public.